The APC-43 Electronic Hook Switch (EHS) provides you with freedom to move away from your Cisco phone and answer calls from wherever you are - simply with a press of your wireless headset call control button. This cable supercedes the APC-42. No more rushing back to your desk to answer calls. The Plantronics APC-42 Electronic Hook Switch (EHS) module enables wireless headset users to place or receive calls without the need to lift the handset of your Cisco phones. For 89xx and 99xx Cisco phones use the APU-72 EHS. 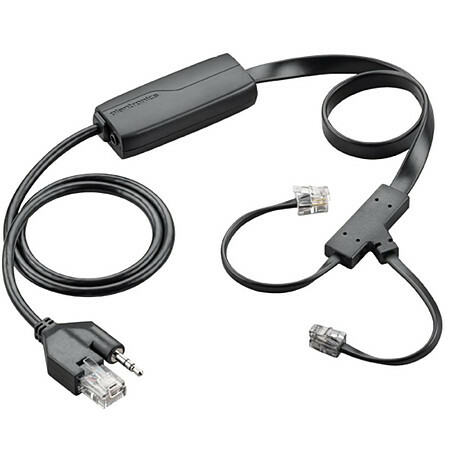 The Plantronics Cisco APC-43 EHS only works with the above headsets. Use the APC-4 EHS for earlier models.